Named for the child who spent her childhood in this sweet house nestled in the woods of Tenants Harbor. Now, her captivating paintings grace the walls of a house built next to a mountain of granite left over from Wild Cat Quarry and just a whisper away from the shores of Tenants Harbor. Annie's House is a quiet, semi-rustic retreat surrounded by tall spruces and a well maintained lawn and gardens. 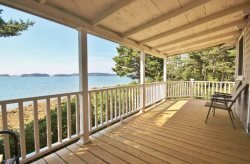 Built for a family of sailors, the house is constructed with the sturdiness of a ship and a delightful airiness that all vacation rentals in Maine should have. Located on Haskell Point Road, a quiet road winding its way along the shore, the house has a right-of-way to the shore just 300 yards from the front door. Here you can launch kayaks or simply sit and watch boats pass in front of you — beyond them see High Island, Southern Island and Northern Island. A repeat renter says her favorite thing to do is walk down to the rocks in the morning with a cup of coffee and watch the sun rise over Tenants Harbor. It would be easy to walk into Tenants Harbor for breakfast, coffee or to pick up the paper in the morning. Or pick up some lobsters or fresh fish. Port Clyde is just a 5-mile drive away and Rockland is a hop, skip and a jump — about 15 minutes up the road. The main part of the house houses the kitchen, dining area and the living room. The living room has a couch, shelves filled with books, a propane-fired woodstove and a television that receives basic reception. There is also a radio and Internet is provided for guest use. Off the living room find the dining area which looks out to the yard and limited views of the water. Find an outdoor table with seating for 4 and a charcoal BBQ (guests must supply their own briquettes). The kitchen is just off the dining room and is centered around an island. There is a full-sized gas stove for cooking, as well as a full-sized refrigerator, microwave, coffee maker and toaster. The house is supplied with cooking equipment as well. The full bath is off the living room, with a claw-foot tub outfitted with a shower head. Upstairs — accessed by a hybrid staircase/ship's ladder with hand railings — find two bedrooms. The first has one twin bed and the second has a double bed. The other bedroom is above the multi-purpose room off the kitchen. This room is the perfect place to take off your shoes after a sandy day at the beach. The bedroom above is very private with beautiful built-ins and 180-degree views of the woods and the yard. This is also a double bed. Annie's House is about a little solitude, peacefulness and tall pines creaking in the salty air — all the while, knowing civilization is just a walk down the road. It's as perfect for 2 people as it is for 4. A dog may be CONSIDERED with pet fee and acceptance of pet policy. We will need to know size,breed and age of the dog. Owner approval is required. Coastal/Shore Proximity:300 yards off the property Shared Access. Waterfront/Shore Access: Access to the water is available via a right of way, a wooded path. The water is 300 Yards from the front door. Ok for launching kayaks or other small water craft at high to middle tides. Shore is rocky. All bedding and bath towels are provided..
Other sleeping notes: 3rd bedroom has separate access from 1st and 2nd bedrooms/bathroom. We are just a call or email away. The house-book will contain contact information and instructions for emergencies, repairs and answers to other frequent questions.